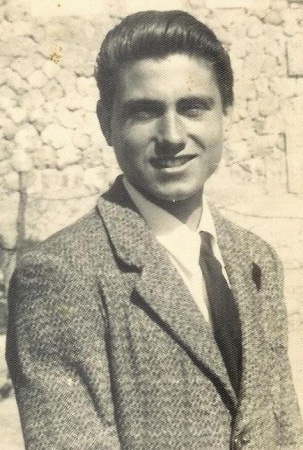 Marcello Maddaluno, age 88, beloved husband of Beth (nee Campbell). Loving father of (the late) Carlo, Marcel (Tina) and Cynthia (Ronald). Dear grandfather of Shanna, Sheena, Tila, Nicco, Samuel, Dante, Gabriella, Andre and Sophia, and great grandfather of 14. Marcello was a quiet man of gentle distinction and old world manners. He immigrated to the United States in 1954 where he established a long distinguished career as a Master Finish Carpenter. He served with distinction in the Italian Navy where he medaled as a top depth charge expert. Family and friends will be received from Noon until 2 pm on Thursday, May 24th at Jenkins Funeral Chapel, 2914 Dover Center Road, Westlake. In lieu of flowers, family suggests donations to the Carolyn L. Farrell Foundation, 26633 Detroit Road, Westlake, 44145. Things will never be the same without you, Papa. We will love you forever. Humility and dignity almost masked the rascal just underneath the skin of our “Papa” who never let a serious moment get in the way of a good joke. He turned every visit into a party and valued his kids, grandkids, great grandkids above all else. Never missing a kid’s recital, sporting event, concert or performance he sat front and center applauding with pride and attention all the while looking like he just stepped out of the pages of GQ. Style, integrity and grace and that rare quality in a man that makes people wish they were a little more like him. His absence will be felt eternally as the memories he created will indelibly remain. Such is the trail left by the shadow of integrity and the heart of a lion.